If left untreated, boiler water derived oxygen will corrode metallic boiler components leading to increased maintenance costs and reduced boiler efficiency. Boiler corrosion control; Oxygen-related metallic corrosion is a significant issue in the operation and maintenance of industrial boiler systems and steam raising plant. To ensure that such boiler systems are well maintained and operate at optimum efficiency it is essential that the correct water conditions are maintained at all times. This can be achieved using carefully selected oxygen scavengers designed specifically for steam boiler corrosion control and feed water corrosion control in steam raising plants. 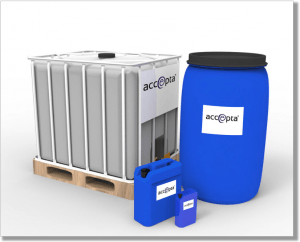 Accepta’s technically advanced boiler water oxygen scavengers are scientifically formulated to combat the detrimental effects of oxygen-related corrosion in industrial boiler systems, hot water systems, and steam raising plant and so help reduce maintenance costs, maintain boiler efficiency and extend plant and equipment life. These include Tannin, Sulphite, Carbohydrazide & DEHA chemical blends. Accepta 2326 Sulphite Yes Neutralised catalysed sulphite liquid for easy use in low and medium pressure boilers. Accepta 2972 Sulphite Yes Catalysed bisulphite liquid. High strength, for use in low and medium pressure boilers. Accepta 2212 Tannin Tannin based liquid oxygen scavenger. It both scavenges the oxygen and forms a corrosion resistant film. Ideal for low pressure and steam heritage applications. Preventing Boiler Corrosion is done through the removal of oxygen and maintaining appropriate alkalinity levels in the boiler water to prevent acid attack. 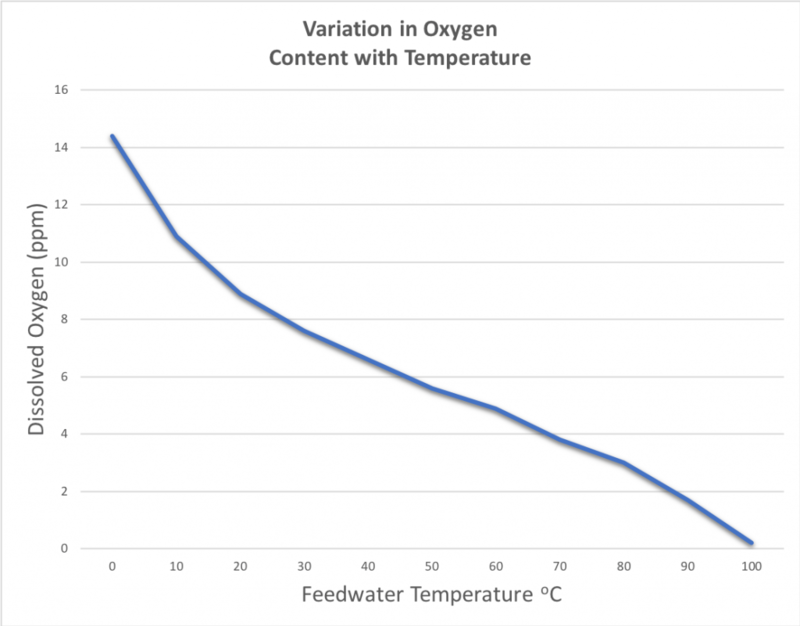 As shown in the chart oxygen levels are tied to the Hotwell feed water temperature with nearly all oxygen gone by the time the water reaches 100oC. For this reason, we recommend keeping the temperature above 80oC and incorporating an Oxygen Scavenger such as Accepta’s high-quality Sulphite or Tannin blends featured above. This will help maintain excellent boiler corrosion control and limit the potential for oxidation. The other risk in an industrial boiler is acid attack which is caused by insufficient levels of alkalinity. Alkalinity naturally builds in a boiler as cycles of concentration increase and in many cases, a bespoke treatment plan will include additional alkalinity builders with a maximum recommended limit of 1200ppm (M Alkalinity) in a Shell boiler running at TDS of 3000ppm. Accepta Alkalinity Builders are available as separate chemicals or as part of our Multi-functional Boiler Treatment detailed below. You may also want to look at our range of Multi-functional Products which combine the oxygen scavenger with a polymer sludge conditioner & alkalinity builder to create a single easy to use liquid to simplify dosing and control.